12.5 ounce Limited Bottles 2019 Harvest. 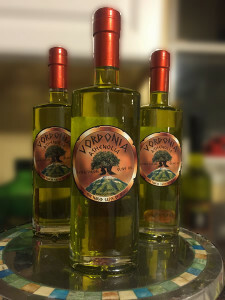 HIGHEST olive to oil pressing ratio in the world. 1 kilo of oil from 3 kilos of olives (34 percent oil). Old Fashion Pressure Press. From start to finish each pressing lasts over 3 hours.. Cold Process/Cold Separated. Once the olives are crushed into a thick past, I add the correct amount of cold water to help make a consistent mix for the pressure press. I separate my oil from it’s natural water content at 42 degrees. Insuring my oil’s pure flavor, aroma, color and longevity. Limited Numbered Bottles. Each year’s harvest range from 600 bottles to 1500 bottles.